Inducted 1998. Her .517 Career Batting Averages is Second-Best in School History. 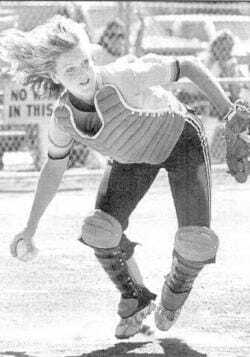 Robertson combined talent with a gritty determination to become one of the mainstays in the Quincy Notre Dame softball program that was one of the state’s best during the early 1980s. Robertson was a three-year starter as the Lady Raiders’ catcher and had a remarkable .517 career batting average, second-best in school history. She was the ideal leadoff hitter, for her speed and uncanny ability to place a bunt anywhere on the diamond made her nearly impossible to keep off the base paths. Once she reached base, she was a pain in the side of opposing defenses, scoring 115 runs (third-best in school history) and stealing 56 bases. She still holds QND single-season records for hits (63) and stolen bases (30) in a season, and her .578 batting average as a senior is the second best single-season average in school history. She was named to the all-tournament team at the single class softball state tournament in 1981, 1982 and 1983. She had the game winning RBI in the bottom of the seventh inning of the 1981 state championship game, in which QND defeated Herrin 2-1. She also holds the record for highest average in the state tournament when she batted .909, with 10 hits in 11 at-bats, to lead the Lady Raiders to the state title in 1982. Robertson attended Drake University but didn’t play softball as a freshman. However, she walked on to the team as a sophomore and eventually started for the Bulldogs for three years, playing shortstop and third base. She was named to the all-Gateway Conference team as a sophomore and a junior. Robertson now lives in Overland Park, Kan., with her husband, Keith, and son, Jack, 2.